Do Angelenos care about the environment? 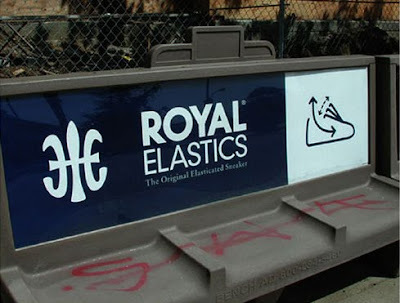 Sometimes it seems the residents of this city are as stuck in their old ways as the mammoths at the La Brea Tar Pits. Yesterday I walked over to a Gulf Coast oil spill vigil. Yes L.A., I walked! I didn't use my car. Can you believe it? But sadly no one showed up except myself and a friendly fellow named Jim Bean. This is unacceptable. There should have been hundreds of Angelenos protesting. But it was just Mr. Bean and myself while hundreds of gas-guzzling motorists passed by with blank stares like they had never seen a person actually standing on a sidewalk before. Perhaps this billboard sums up the glaring contradictions of car-crazy Los Angeles more than anything I could write. 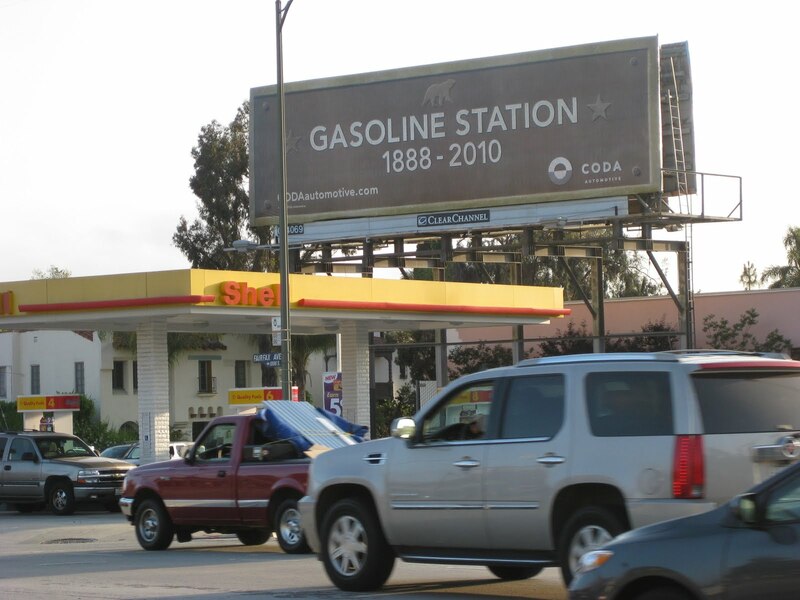 Above the Shell gas station at Olympic and Fairfax is a brilliant billboard by electric car company Coda Automotive pronouncing the death of gas stations. After this disappointing turnout for the oil spill vigil that never was, I took the bus to Brentwood for a friend's birthday. L.A. needs to clean up their bus stations. It is just awful. The bus benches frankly look like something out of a Toys 'R Us store. The cheap plastic design and ugly brown color makes it humiliating for bus patrons to sit and wait for the bus while L.A.'s caravan of luxury cars and SUVs blow by them. Plus all the trash at these stops is sickening -- these stops are just filthy. And there is not enough space to wait for the bus. These poor bus riders often have to block the sidewalks or driveways because like everything else in L.A. the car comes first in every design aspect. And why does such a miniscule fraction of our city's population -- mostly the crazy people and new immigrants -- take the bus in L.A. unlike a normal city where everyone takes public transit? Because many people in L.A. would never consider the bumpy bus ride for all the above reasons. I recommend a ride on the bus to all Westsiders at least once so they can see how their maids, gardeners, busboys, cleaners, valets, trash collectors and painters get back and forth to work every day. And then this morning I was awoken by a loud, dirty and illegal gas leaf blower being used in the driveway of the apartment across from me. Time and again I see apartment owners violate the city's ban on gas blowers. 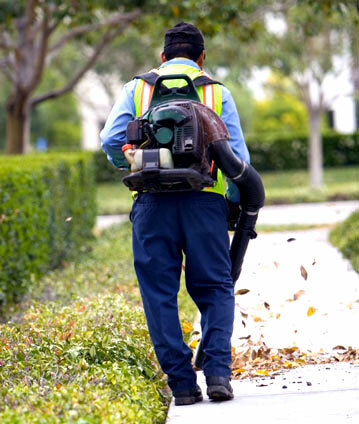 According to the organization Zero Air Pollution Los Angeles, leaf blowers generate as much carbon-dioxide emissions in one hour as a car driven for 100 miles. And these dirty leaf blowers produce a noise decibel level of 70 to 90 decibels. Healthy daytime noise levels should not exceed 55 decibels. No wonder they wake me up at 8:30 in the morning! The city of Los Angeles has banned gas-powered leaf blowers since 1998. To report an incident call the police or go to the Zero Air Pollution website. The other violations I notice often concern the lack of water conservation efforts by city residents. The city of Los Angeles restricts outdoor irrigation to two days a week -- Mondays and Thursdays -- to combat L.A.'s severe water shortage. But time and again I see my neighbors run their sprinklers like there is no tomorrow. It seems the spigots are flowing every day in clear violation of the ban on watering except those two days. I see the water running on the lawns of homeowners and apartment owners alike. 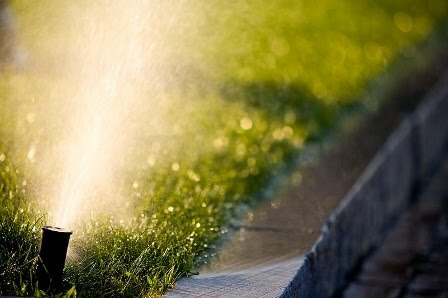 To report a neighbor watering their lawn on an off-day, call the Department of Water and Power at 1-800-DIAL DWP or click here for the DWP website. And as if on cue right now as I write this there is a bottled water delivery truck outside of my window. What a waste! do a great service making us aware. I wouldn't disparage all L.A. activists over the what happened Tuesday night. I was surprised that not any of the organizers of this vigil bothered to show up. There was some rather confusing information in the original e-mail I received from moveon about this vigil which may have contributed to it's not getting much draw. The address given in the e-mail was 5670 Olympic Blvd but it also said Olympic and Fairfax. This is about ten blocks apart. I went to the 5670 address and stayed until 7pm. When no one showed up I grabbed a bus and went to Olympic and Fairfax. This is where I ran into Josh taking pictures of the Coda Automotive billboard. That this event was poorly organized is no fault of L.A. activists, but of one flakey, perhaps wannabe, organizer. I e-mailed my complaints to moveon, so perhaps they won't trust this particular organizer to host an event again, at least that is my hope. 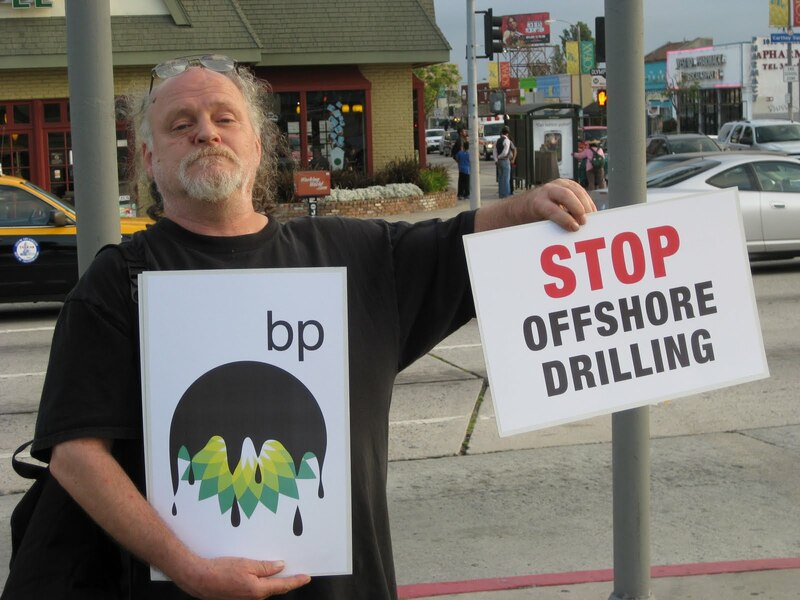 I have attended two "Seize BP" demonstrations that were well attended, and one fundraiser that was VERY well attended. Keep up the good work Josh. Hope to see you around at other demonstrations. Plenty of normal people ride Metro in L.A. You just have to get out of the elite Westside Ghetto to see it. I ride the Gold Line, Red Line, Metrolink, Metro Local and Rapid buses and OCTA and see plenty of "normal people." The Westside does not represent the majority of Los Angeles. It's mostly populated by wealthy Northeast transplants who think they know more about the city than those of use who have lived here our whole lives.